Blog What is Audio Compression And How The Hell Do You Use it?! If you were like me when you first started learning about audio compression, you probably said a bunch of “what the hells”, “What does that even mean?”. I’ve been recording and mixing music for years now and I STILL get confused on compression sometimes. Teaching it to you guys has had tremendous benefits on my understanding, so I’m gonna break this down for you. At its basic infant state description, a compressor is really just an automatic volume fader control thing-a-ma-jigger. Remember trolls, I said basic. It does more than just turn things up or down, but I’m trying to simplify it for the normal people like me and my followers. It can add dynamics, punch, energy, sustain, and add tone, but for now I want to stick to the basics. I will be covering more on this topic as the weeks go by. Music and all its instruments and variety of sounds is by nature very dynamic. Audio compression helps us tame these dynamics and “Glue” them together. Dynamics are very good in music, so we don’t want to kill the dynamics, just tame, enhance, massage, where needed. Music should breath, not be a flat line. lets dive into the controls of a compressor and I’ll explain. This is the “BOSS” of the knobs in my opinion. Mr. Threshold tells all of us if there is going to be any audio compression or not. If the Threshold is set to “0db” then aint a damn thing happening on the job today. You have to set the threshold at what volume level (dbs) you want the compressor to kick on. 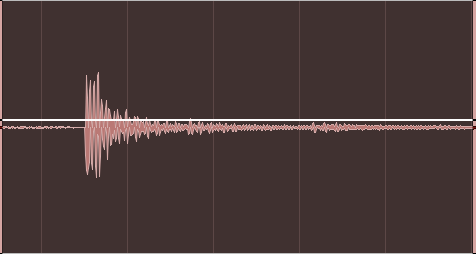 If you turn the threshold down just a small amount, then you prob will just compress the peaks of audio going over your threshold, and not compress the rest of the audio below your threshold. If you turn the threshold WAY down you will essentially be compressing the whole audio signal, because most of the signal will have met the threshold and gone way over it. Now This SOB was the most confusing part of a compressor for me. After doing tons of research, I see this explained with the least amount of clarity. I also see people getting confused between what Ratio and Threshold do. 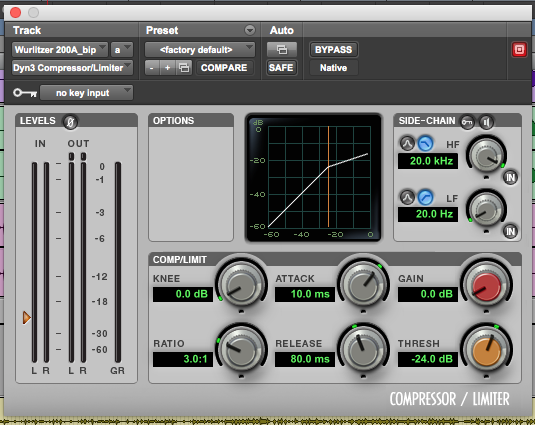 Threshold tells you WHEN to compress, and The Compressor Ratio tells you HOW MUCH to compress once it’s passed the threshold level. Comprende? I’ll go into more detail in a second, but the main thing you need to know is the lower the Ratio settings, 1.5:1 2:1 3:1 etc etc, the LESS compression will be taking place. The HIGER the Ratio, 5:1 6:1 8:1, the more compression you will be using. So if your ratio is 3:1, then for every 3dbs an audio source (snare) goes over your set threshold, only 1db will actually be allowed to pass that threshold. I guess Mr. Ratio is the door man. He decides how many people (dbs) get through. So for every 2dbs (2:1) above -10dbs (threshold) only 1db of the snare will pass the threshold. So just increase the Ratio number in this equation and you can see that more compression will be applied. confusing I know!! Once you get your head wrapped around it, it becomes easier. Just remember, low ratio less compression, high ratio more compression. So if Mr. Threshold and Mr. Ratio decide when and how much audio compression is applied, Attack and Release decide how fast or slow, and for how long the compression is applied. This is where compression can affect the tone of the sound, not just the volume. The faster you have the attack set, the quicker the compressor clamps down on the signal. If its set at a slower attack, the compressor will let some of the signal pass before it starts to act. We are talking milliseconds here. SUPER small measurements. If you have a fast release, then the compressor will let go really fast after it initially clamps down. If you have a slow release, then it will hold on and compress a little longer before it lets go. This compressor had a VERY fast attack and release, with a low threshold and a 3:1 ratio. When I set the compressor to attack that initial transient I completely squashed the sucker to where it was almost the same volume of the “tail” or “sustain” of the snare sound. This is extremely exaggerated to illustrate the effect, but I hope you catch my drift. So thats what you could do with a snare, squash that transient down to the level of the tail, then bring up the overall volume of the whole snare which would give you a fatter sounding snare or tone. That’s just one example. You could set the release to be a little longer holding on to that sustain or tail, then bringing the overall volume up even more. Remember, It’s ALL about using your ears and not killing the sound and the dynamics of whatever your compressing, whether it be individual tracks or a stereo mix. What is compression in music? You’re starting to understand I hope! If your compressor has a “Knee” knob, don’t be scared. You have hard knee, and soft knee. When the compressor kicks on, a Knee will tell how hard or how gentle to clamp down on the source. A hard Knee will clamp down hard and may be more noticeable of an effect. A soft knee will gently ease into the compression, hopefully causing a less audible compressing sound once it kicks on. So if you’re trying to gently compress a vocal for instance, and you want it to stay natural sounding, you could set it at a softer knee setting to ease into it. Like always use your ears. The last setting I want to address is the “Gain” knob, or “Make Up Gain”. So once you’ve compressed your signal it will most likely be turned down by however many Dbs the settings applied. So now you simply need to turn up the volume back to it’s original state before being compressed. “Make up” the gain (volume) lost. The difference between uncompressed and compressed is typically a more balanced performance of the audio source. Be careful not to ruin the performance with over compression. The main lesson here is USE YOUR EARS. There are more advance uses for audio compression like parallel compression, side chain compressing, and multi band compressing, but for now I just want you to focus on what I outlined today. I will be diving into more depth on this topic and covering advanced techniques as the weeks go by. If you want to stay updated on my best FREE training and get updates click the green button below. I’ll also give you my free ebook immediately. Comment below and let me know your struggles with compression or any cool ways that you use it in your mixes. I’m always down for learning new stuff! If you want to see PART 2 on compression (Attack and Release) Click Here! If you want to learn about EQ check this article out. If you want to watch a video of me breaking a compressor down check this out! Pingback: Compressor Ratio Explained For Beginners. It's not that hard!